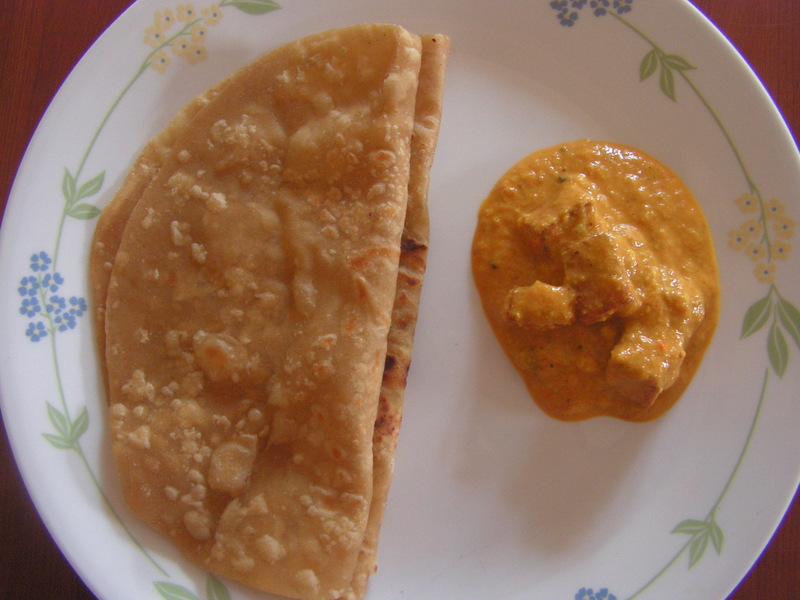 When it rains heavy during the rainy season we feel like having something new for a change and I tried out this Shahi Paneer recipe with simple ingredients with Roti. And Wow it really tasted great and I thought of sharing the same with you all and for that recipe using ghee or oil is your choice to make it. 1. 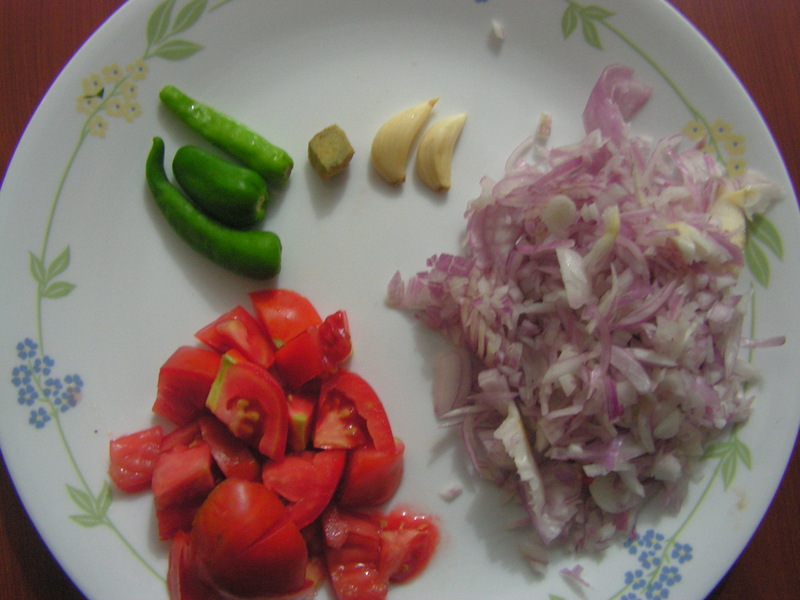 Wash, peal and chop onions, chop tomatoes, peal garlic and keep it aside as shown in the above image. 2. 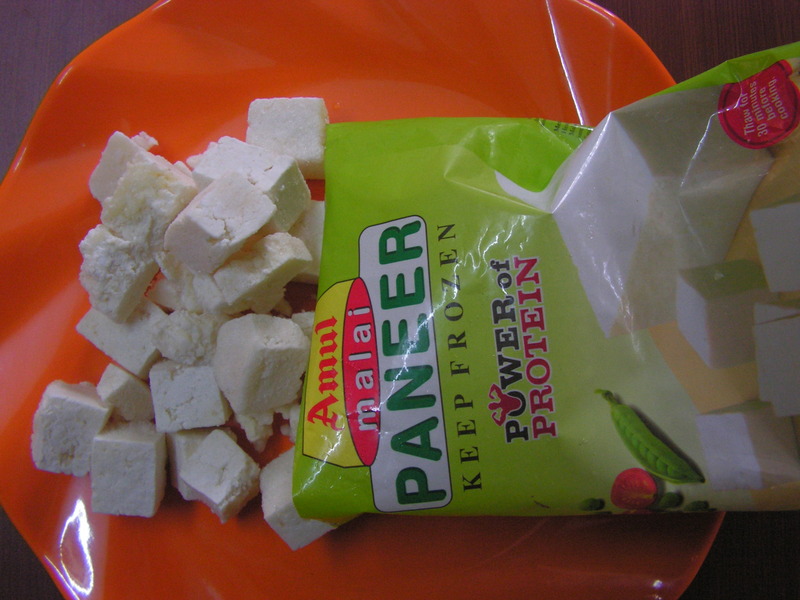 Empty Paneer pack and immerse it in water for a while. 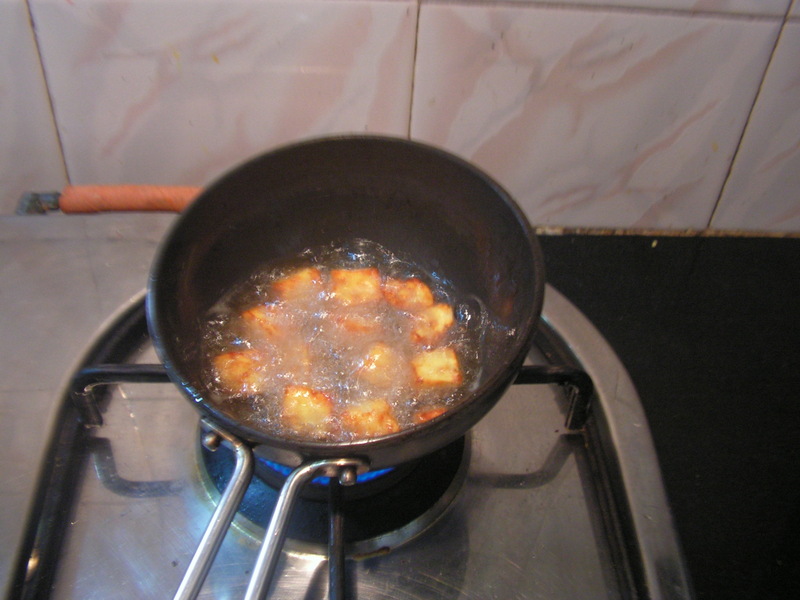 Squeeze out the water and heat oil in a spatula and fry paneer cubes till light brown and keep it aside. Once done also fry raisins and half the quantity of cashews in oil and keep it aside. 3. Grind chopped onion, tomato, garlic, ginger and 2-3 cashews in the mixer to a fine consistency. 4. Place a wide pan with 2-3 teaspoons of cooking oil /ghee in it. On heating add the grind masala and salt to it and fry till it starts releasing oil. Give a stir and on simmering the flame add all powders and stir. Add milk to it and bring it to a boil till it turns thick. 5. Add fried raisins, cashews(half the quantity) to it and also add milk cream and fried paneer cubes from step-2 to it. Bring it to boil on simmering the flame checking for salt. 6. Transfer it to a serving bowl garnishing with remaining dry fruits, cilantro and enjoy with Chapati or Roti! Good to remember: 1. One can use ghee in place of oil. I prefer cooking oil since I do not want the dish to be rich. 2. I use a few cashews in grinding to make the gravy tastier and to thicken as well. 3. 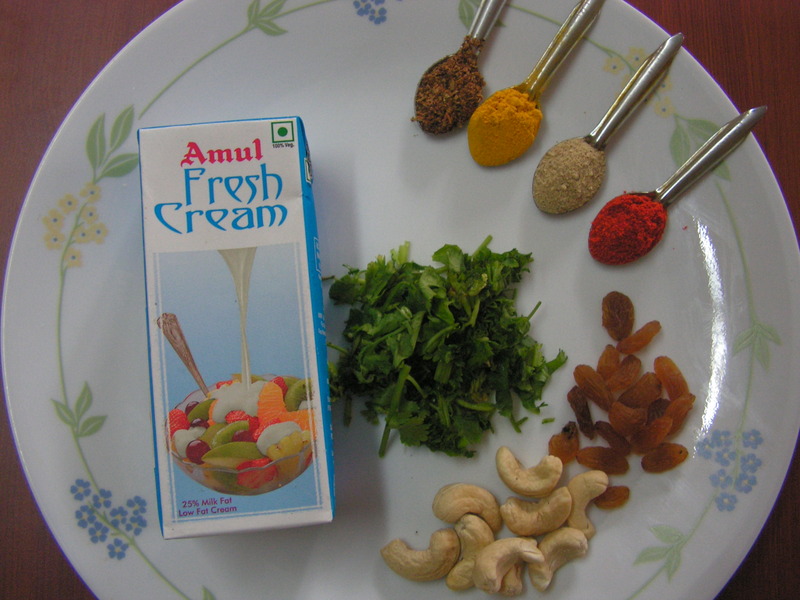 I have used Amul fresh cream (low fat cream) which one may replace by home made cream if available. This entry was posted in Uncategorized and tagged North indian dishes, Paneer dishes, Side dish, Side dish for Rottis. 1. Place wide pan with 2-3 teaspoons of cooking oil in it on medium flame. When heated add mustard seeds and cumin seeds to it. When both start spluttering add curry leaves. 2. Add chopped potatoes to it and close it with the lid adding little water and pinch of salt so that potatoes is cooked in a while. 3. 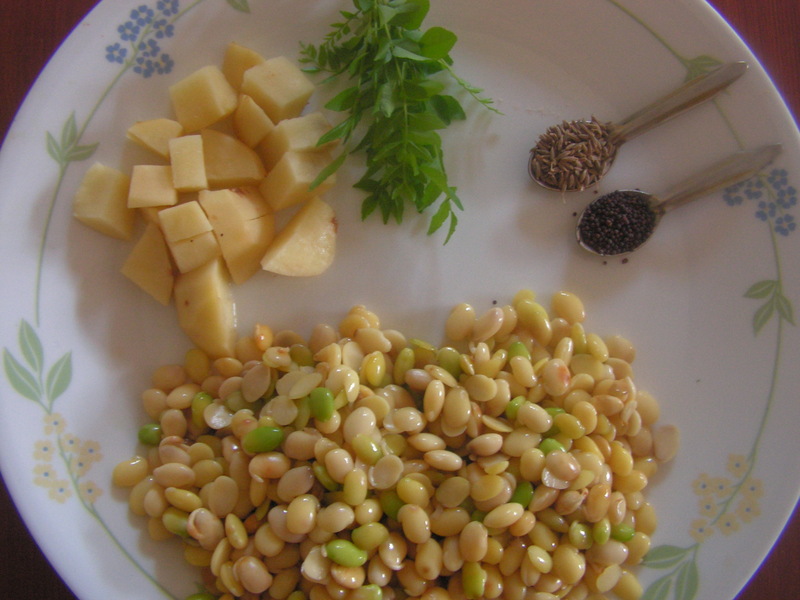 Place surthi beans in the cooker with a pinch of salt adding adequate water and cook it til done. 4. Once the pressure is released grind 1/4 quantity of cooked surthi beans in the mixer and keep it aside. 5. 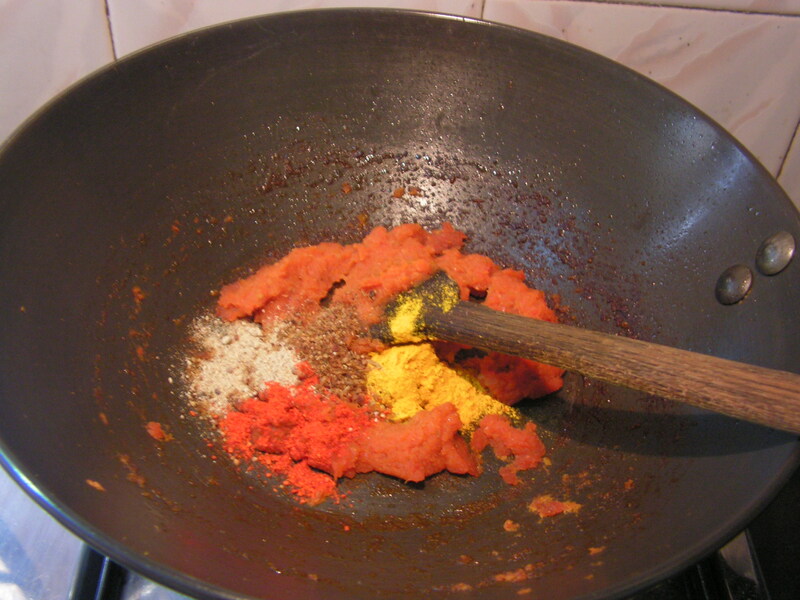 Grind the wet masala ingredients in the mixer adding a little water to a medium fine consistency. 6. When potato is cooked add the grind masala to it and bring it to boil on medium flame till the raw smell goes stiring at regular intervals. 7. Once the wet masala is cooked, add cooked surthi beans and also grind surthi beans from step 4 and add a little water to bring the gravy to required consistency. Check for salt and bring to boil till pleasant aroma makes it irresistible. 8. Transfer it to a serving bowl and enjoy with either roti or chapati ! 1. 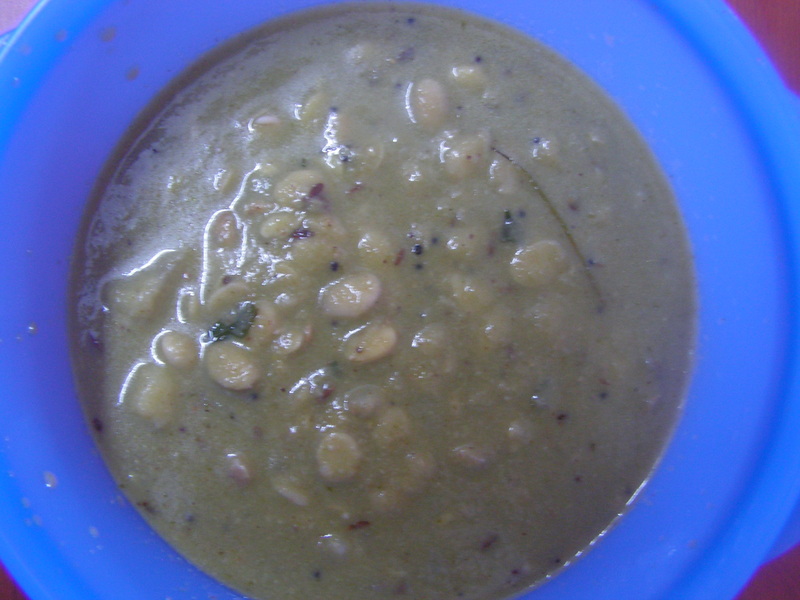 Surthi beans should be pealed twice as we do for other dishes like the Hithkubele. 2. The reason to add grind surthi beans not only to thicken but for extra flavour. This entry was posted in Uncategorized and tagged Avrekalu/Surthi beans dishes, Lunch side dish, Side dish for Rottis. 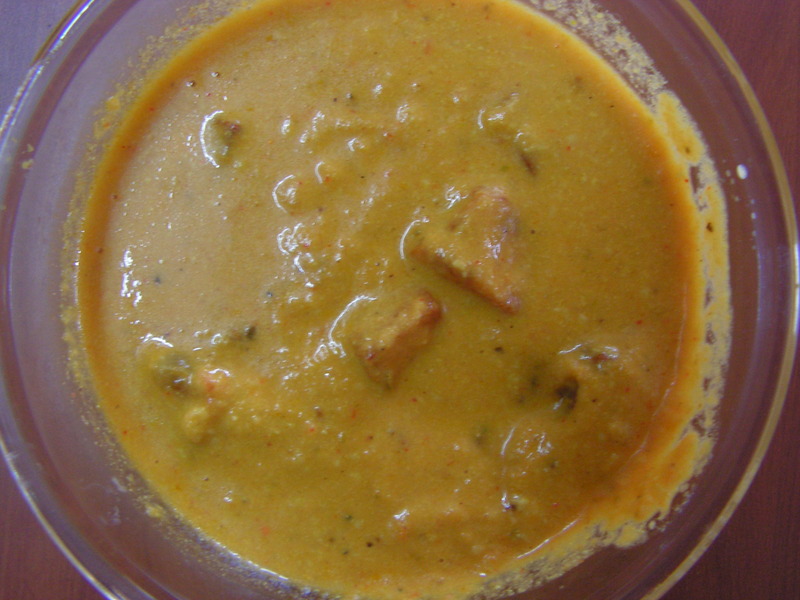 Mulangi/Mooli / Radish is a popular ingredient in South Indian cuisine – especially in sambar where brinjal or white radish are favoured vegetables. It can be a polarizing topic of conversation – its pungent odour versus its unique flavour and aroma. Mooli paratha has given radish instant fame and acceptability, and radish is also used in salads. The salad is usually prepared in combination with onions and has a unique taste. Nutritionally, white radish has excellent value and its greens are kidney-friendly. Mulangi curry is simple to make and a pleasure for radish-loving taste buds. Here is my version of Radish curry. 1. Wash, peel and chop radish into small bite size pieces and keep aside. 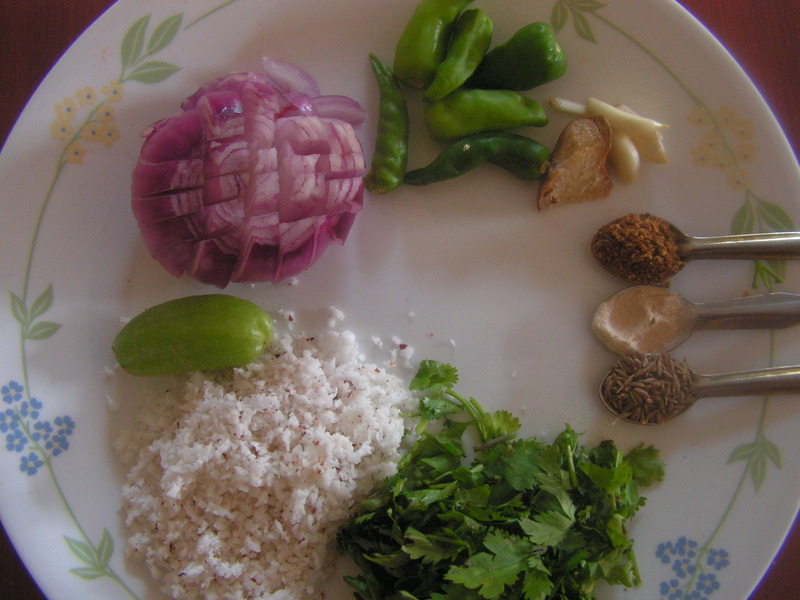 Chop green chilly, grate coconut, wash and chop cilantro as well and keep aside as shown in image-1 and 2. 2. 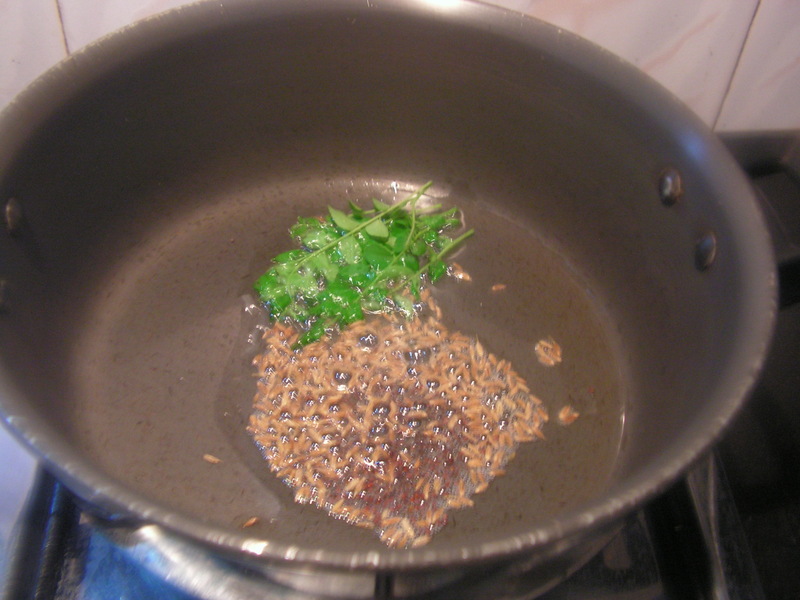 Soak Moongdal in water for about 15 minutes. Add chopped radish to it and cook in the cooker till done. 1. White radish should be tender, else it won’t cook well. 2. It is better the chilly used for this dish be of the spicier variety, since no chilli powders are being used. 3. Both the veggie and dal should be cooked well to gain texture to the dish. This entry was posted in Uncategorized and tagged 45 minutes, Lunch side dish, Side dish for Rotis, Side dish for Rottis. 1. Wash and cook fresh green peas in cooker, adding little salt till soft. 2. Wash and chop tomatoes, wash, peel and chop onions fine and keep it aside as shown in image-1. 3. Place a skillet with cooking oil in it on low flame. Add crushed garlic cloves and fry for a while. Add cumin seeds to it. When it splutters add chopped tomatoes and salt and fry it till mushy. 3. When done, add chopped onions from step-2 to it and fry it till it turns transparent. 4. When onions turn mushy, add all powders and stir well. 5. Finally add cooked green peas from step-1 and stir well. Add chopped coriander leaves and serve hot with roti and chapati. 1. Use fresh green peas for the dish for taste and flavour. 2. 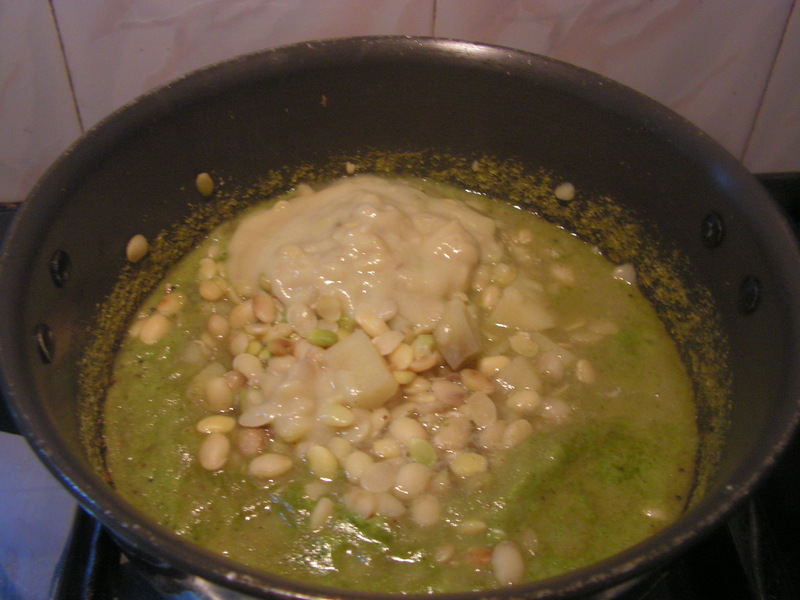 Do not over cook peas since it will spoil the taste of the dish. 3. One can add any spice of choice. 4. Use wooden spatula to stir in to avoid from getting peas crushed. This entry was posted in Uncategorized and tagged 30 minutes, Newbee, Side dish for Rotis, Side dish for Rottis. 1. Wash, peel and chop onions, chop ginger finely as well as garlic and keep it aside as shown in the above image. 2. Wash and chop palak/spinach finely and cook it directly in a wide bowl on medium with minimum water till done adding a little salt. 3. 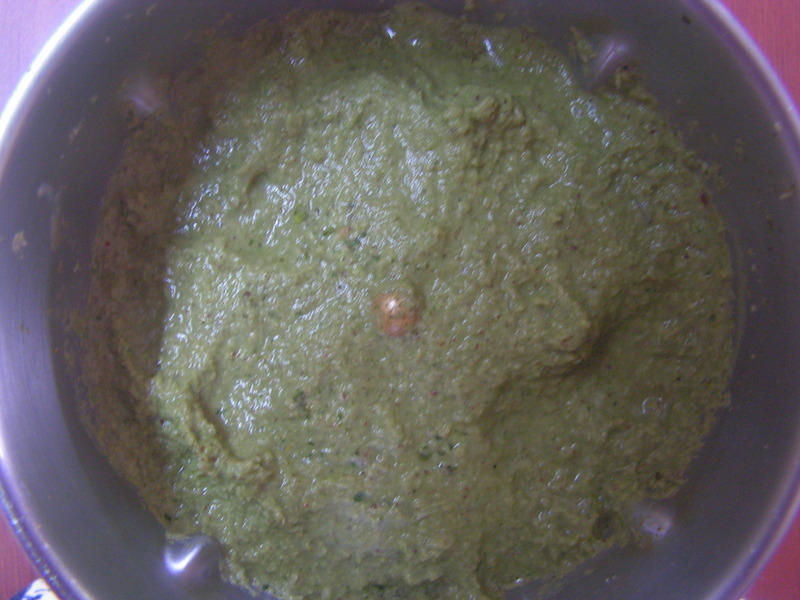 Drain water from cooked palak on cooling and grind it in the mixer for a few seconds. 4. Grind chopped onions, ginger, garlic and cashews using drained water from cooked palak to a fine consistency in the mixer. 5. Place a skillet with 1 cup oil in it on medium flame. 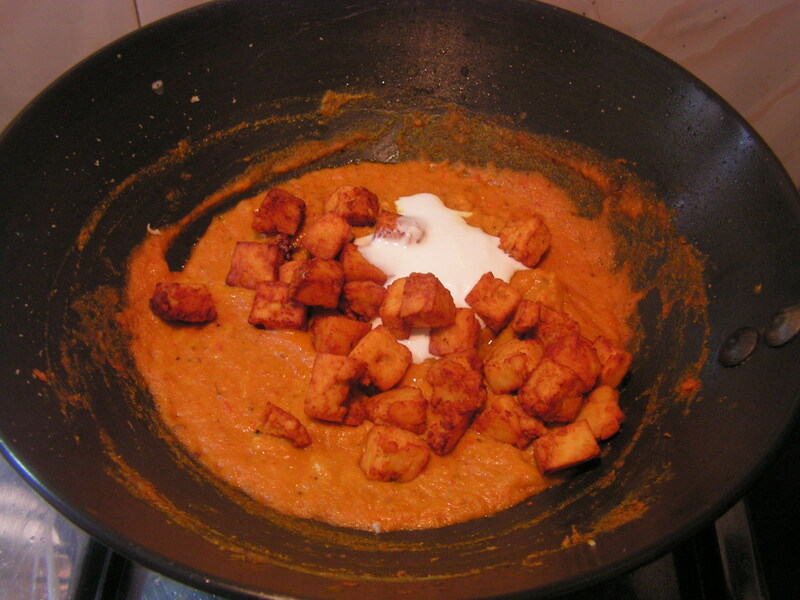 On heating, fry paneer cubes till crispy and light brown; stir at regular intervals. When done place it in a colander to drain any extra oil. 6. Place a skillet with 3-4 Teaspoons of cooking oil in it on medium flame. 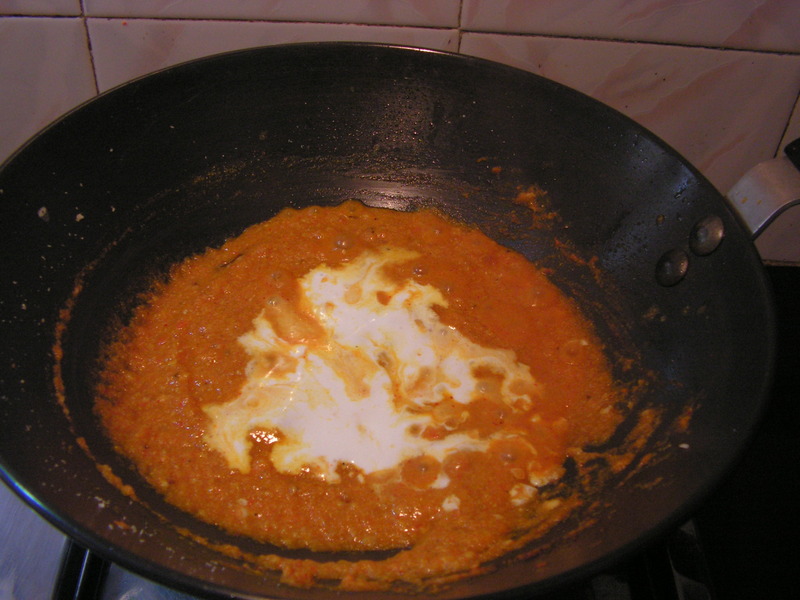 On heating add ground masala to it and fry till all it is thickened, stirring at regular intervals. 7. 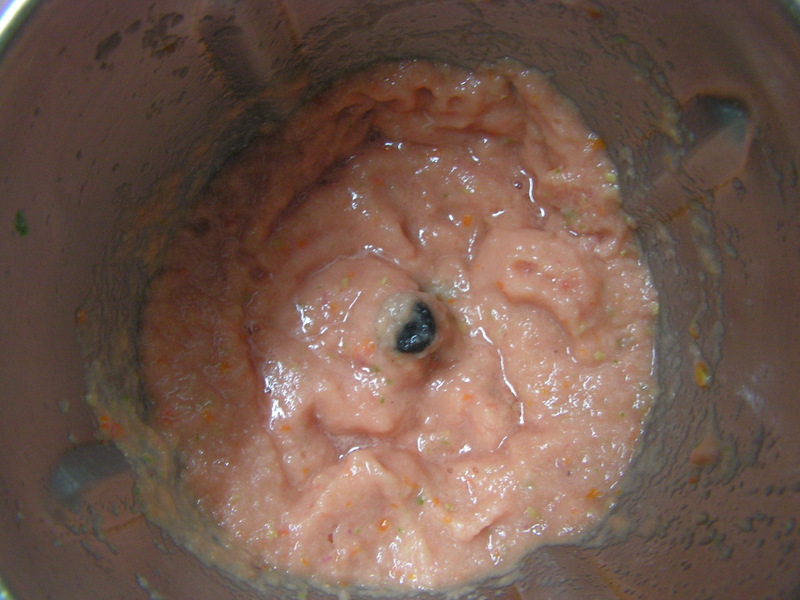 When done add all the powders one after the other and stir well. 8. Add cooked and ground palak from step-3 to it, also add milk, cream and a little water , salt , a pinch of sugar and bring it to boil on low flame. 9. Finally add fried paneer cubes from step-4 to it and bring it to boil on low flame stiring continuously with a wooden spatula so that it does not get crushed. 1. Use fresh palak greens for the dish. 2. One can even make use of the cottage cheese for the purpose instead of the cubes. Cottage cheese has salt in it, and paneer doesn’t. 3. One can make use of green chilly instead of red chilli powder. Green chilly should be cooked with palak and ground with the wet masala. 4. Cooked palak should not be ground smooth. This entry was posted in Uncategorized and tagged Gravy, Lunch side dish, One hour, Paneer dishes, Party dish, Side dish for Rotis, Side dish for Rottis. Okra as it is called in the U.S , Lady’s finger in UK and India, Bendekayi in Kannada and Bhenda in konkani. I have already put up Okra dosa, okra stir fry with potatoes and also Bhenda sukke, an authentic konkani dish . Today I would like to put up a Maharashtrian dish whose recipe I borrowed from my sister and that was really relished by all at home. I thought why not share it with my fellow bloggers and hence it is here today on this blog. It is a simple dish and easy for the amateurs as well. 1. Wash and dry Okra with a clean cloth and remove the tips and bottoms. Slit and apply little salt to it and keep it aside for a while as shown in image-1. 2. Wash and chop tomatoes, wash, peel and chop onions and keep it aside as shown in image-2. 3. Place a skillet on medium flame with 1/2 cup cooking oil in it . On heating, adjust the heat and fry slit okra from step-1 to it and fry till light brown. Put it in a colander till the seasoning is done. 4. Place a skillet with 2-3 Teaspoons of cooking oil in it on medium flame. On heating, add slit tomatoes and a little salt to it till it turns mushy. Later on add chopped onions as well from step-2 to it and fry till transparent. 5. When done add turmeric powder, chilli powder and dhania-jeera powder and stir well. 6. When the seasoning is well fried, add fried Okra from step-3 to it. Mix well and switch off the flame. Serve hot with either dal and rice or even with curd rice. 1. Use only medium tender okra. 2. Adjust the flame of your gas stove to fry Okra. Negligence will burn the veggie and taste bitter. 3. Check for salt since veggie already contains salt. This entry was posted in Uncategorized and tagged 45 minutes, Lunch side dish, Side dish for Rottis.